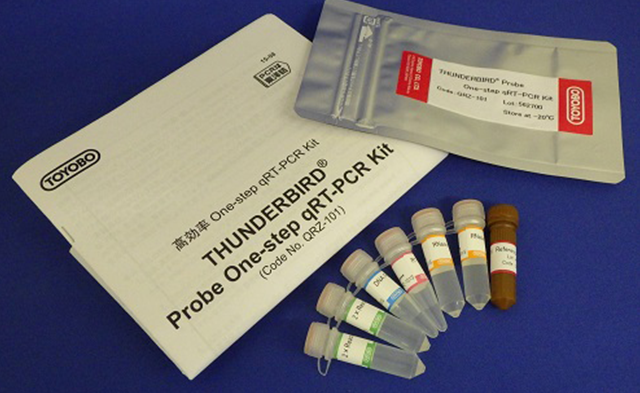 THUNDERBIRD Probe One-step qRT-PCR Kit is a one-step real-time reverse-transcription polymerase chain reaction (RT-PCR) kit using the highly efficient reverse transcriptase "ReverTra Ace®" and Tth DNA polymerase as a PCR enzyme. This product can be used mainly in TaqMan® probe assays. The one-step system is suitable for high-throughput analysis because of its simple reaction setup. In addition, this system can reduce the risk of cross-contamination. The combination of the two enzymes and optimized buffer system enable the effective detection and quantification of a small amount of RNA. This kit can also detect various kinds of RNA with different sequences because it is tolerant of target sequence diversity.